As 0.9992 is near enough to 1.000, the dew point may be taken as 372.0 K.
This relation enables the composition of the vapour to be calculated for any desired value of x, if a is known. For separation to be achieved, a must not equal 1 and, considering the more volatile component, as a increases above unity, y increases and the separation becomes much easier. Equation 11.14 is useful in the calculation of plate enrichment and finds wide application in multicomponent distillation. Whilst a does vary somewhat with temperature, it remains remarkably steady for many systems, and a few values to illustrate this point are given in Table 11.1. It may be seen that a increases as the temperature falls, so that it is sometimes worthwhile reducing the boiling point by operating at reduced pressure. When Equation 11.16 is used to construct the equilibrium curve, an average value of a must be taken over the whole column. As Frank(13) points out, this is valid if the relative volatilities at the top and bottom of the column differ by less than 15 per cent. 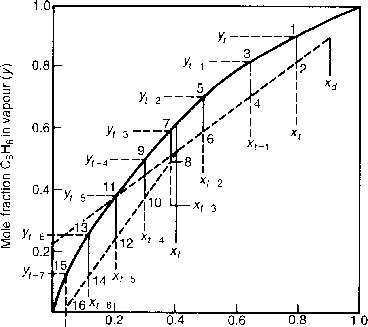 If they differ by more than this amount, the equilibrium curve must be constructed incrementally by calculating the relative volatility at several points along the column. For many systems K is constant over an appreciable temperature range and Equation 11.11 may be used to determine the vapour composition at any stage. The method is particularly suited to multicomponent systems, discussed further in Section 11.7.1.